Transfer Balls: Following the Mirror’s news that Frenkie de Jong had agreed to join Manchester City for £60m comes news in the, er, Daily Mirror that he hasn’t. But he might. 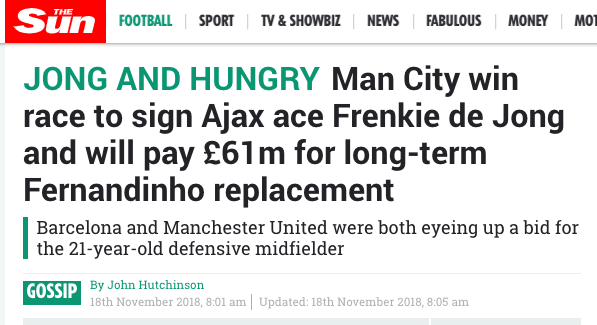 The paper of record (surely clickbait factory – ed) says City will have to pay a club record £75m for the Ajax and Netherlands midfielder. It’s been three days since the Sun said Frenkie de Jong to City was done deal – three days since the Mirror told its readers City “have beaten Barcelona” to the signing. Manchester City “have blown the competition out of the water”. However, Spanish champions Barca are also very keen on De Jong, and several other top clubs are monitoring the rapid progress he’s making this season. Why is £75m the fee in a “bidding war”? It’s more than the £60m it cost city to sing Frenkie three days ago.